Stonehouse Pool Viaduct (also known as the Victoria Park Viaduct) was situated on the Cornwall Railway, between Plymouth Station (Millbay) and Devonport Station, and was built in 1858/59. It was the only one on the Cornwall Railway designed to carry double broad-gauge track and was built of timber fanning out from the tops of short masonry piers. Stonehouse Pool Viaduct at 247 miles 31 chains mile post mileage from London Paddington Station via Bristol Temple Meads Station and Plymouth Station (Millbay), was 107 yards in length and 57 feet in height, according to "The History of the Great Western Railway: Volume 2: 1863-1921" by Mr E T MacDermot, revised by Mr C R Clinker, published by Messrs Ian Allan Limited, in 1964. These dimensions are not guaranteed by the Old Devonport.UK website. Its length was 320 feet between the abutments and its width was 26½ feet between the parapets. 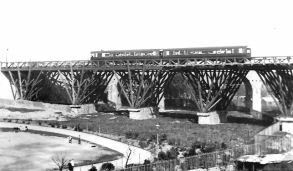 The woodwork of the old viaduct was supported on short masonry piers, with six spans, one of 20 feet and the other five of 60 feet. Work started on rebuilding the Viaduct in February 1907. The masonry piers were increased in height with brickwork, with "slots" where the old wooden legs radiated from the top of the original piers. New brick piers were also built midway between the existing ones so that the new structure had eleven spans, all but one of which were 30 feet in length. This gave greater stability. Steel girders were then placed beneath the roadway resting on top of the new brick piers and the wooden structure then safely removed. And all this was done with interrupting the flow of rail traffic. The construction of the additional brick piers required the Great Western Railway Company to purchase some small plots of land in Victoria Park.